Okay, How To Catch a Cold is still in the same state it was before (finished but unpublished) but the second of the three books I started is now finished, too! This one is a children's novel about The Greatest Sea Captain the World Has Ever Seen. Gasp as he navigates his ship through the Floating Flames, be amazed at spectacle of a sea covered in Pink Cloudweed, hold your breath as he confronts The Dreaded Pirate Captain Montigus d'Ark! I'll need to do a few rounds of edits before sharing any samples but this one was a lot of fun to write. When I decided to take a break to write, I really should have been stricter with myself and only started one book. Instead, I started three. While multitasking and context-switching may be a good thing in the fast-paced, high tech world of the Internets (and I'm not convinced it is), there's a chance it's really unhelpful when you're trying to write a book. 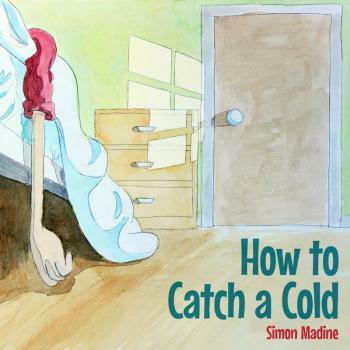 It's a pencil and watercolour illustrated story about a boy's attempts to avoid school by catching a cold. Now to move onto the second stage of book writing: wallpapering my bedroom with rejection letters. Really, it looks worse than it is. I'm actually just getting my tonsils out but seeing as it's only really teenagers that get their tonsils out, I'm trying my best to pretend there's a parasitic fungus attacking the planet rendering everyone helpless and my blood is the only cure. Things will be quiet here for the next few months. I'm taking a break from tech writing for a while to see if I can write something else. You might remember the last time I did this when I wrote Explanating and tried the (admittedly, not very successful) read-then-buy experiment. I'll update again when I've got something to show for myself.